Woven in chenille, this tapestry is a delight to behold. The deep yellow background lets the brilliant spray of flowers in the bouquet burst forth in “Floralie”. Offsetting the beautiful red flowers are sprigs of green leaves that add depth and balance to the other colors. The border picks these colors up nicely, using flowers in the border to frame this piece well. 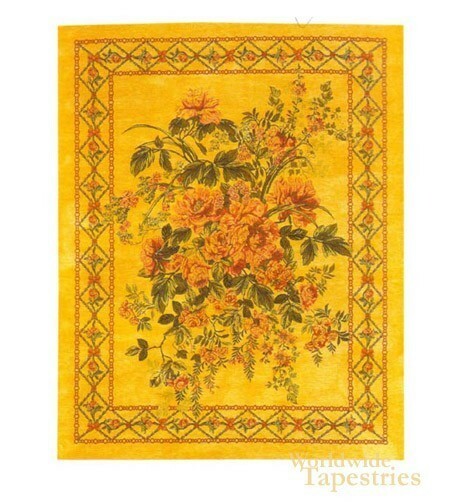 This tapestry is made from Chenille, a great material for tapestries. It’s super soft to the touch, yet extremely durable. This tapestry is lined at the back and has a tunnel for easy hanging.